September at Wellnessdiaries.com is Remember The Bees Month. “What about honey?” What about bees? 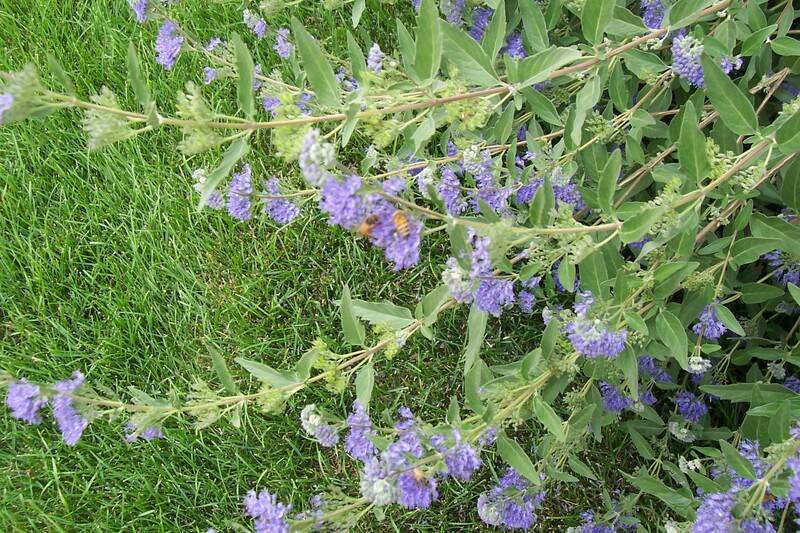 Local honeybees on a Bluebeard (Caryopteris) shrub. Vegan sweeteners such as Stevia and Agave nectar are better for the bees. Try some of these as replacements for honey; but please get to the root of the issue and avoid the use of toxic yard herbicides and pesticides. These are some of the worst substances for bees. Many hands make light work. Think of the difference we can make in helping bees to thrive by using safe, inexpensive home remedies instead of the hideously toxic herbicides and pesticides that are so harmful to the bees and the environment; not to mention human health. Anyone eating a plant-based, (veg) diet will have likely heard this commonly asked question regarding food choices. (Briefly onto other groups,) anyone familiar with the natural world, and plants, is aware of the important role bees play on the environment, and especially on world wide food production. This ongoing debate throughout the veg community about honey and just how much is okay to eat is a small sliver of a much larger picture. Perhaps all of us could ask, “What about the bees?” This question, I believe is a look at the right perspective. As a veg, but also a naturalist, with background in both botany and horticulture, I am well aware of the ethical concerns regarding honey; and also aware of the importance of bees on our planet, the key role they play in the food we eat. Personally, I love bees! As a naturalist/ botanist, how could I not love bees? For I know just how vital they are to the delicate balance of life on our planet. They help to encourage the growth and spread of vegetation throughout the world. Bees are responsible for pollinating millions of plant species, helping the plants to reproduce, as part of life cycle and ecosystem balance; not to mention all of the food crops affected directly be pollinators. Bees, in a major way, are key to our having food to eat. 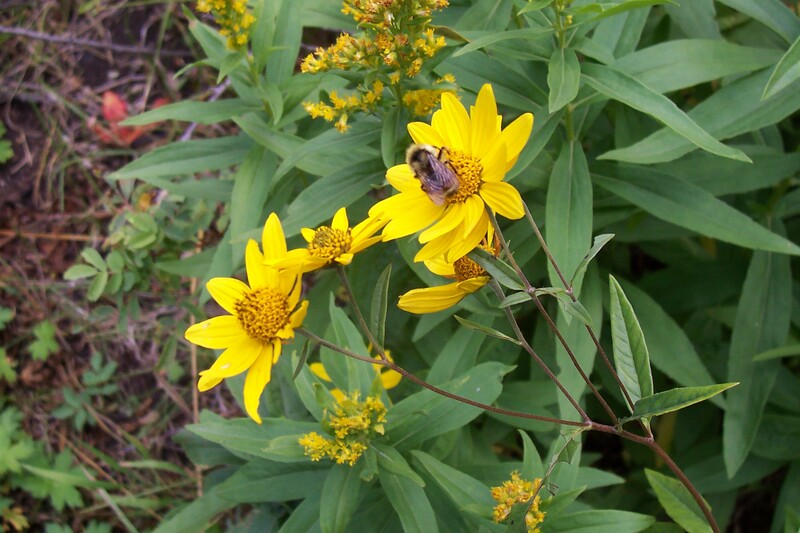 With many working years spent among cultivated trees, shrubs, vines and flowers, I have learned some of the bees’ favorites among cultivated plants. 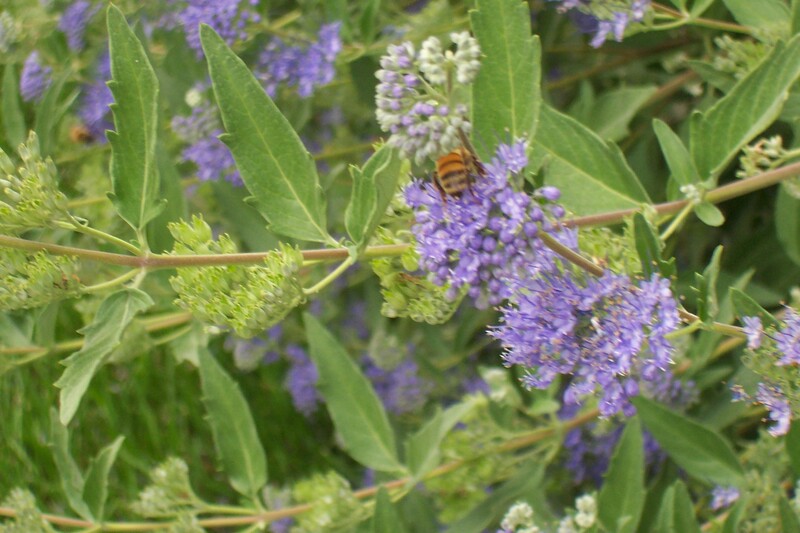 While working countless hours among all types of landscape, and edible plants, I have noticed that bees especially love many of the mint family, (often blue, particularly Lavendar, Salvia and Russian Sage.) They also love some Aster famiy such as Echinacea. I have observed that these listed are scarcely without a swarm of bees on them, as they actively dive deep into each flower, head first. For me, this is exciting! It is also comforting. It is a frequent reminder of nature doing what it is supposed to do. It also reminds me just how vital it is to respect and honor nature’s ways and educating others on the importance of, and how to do the same. No doubt about it, part of respecting nature, is to chip in to make sure that bees are here to stay. We cannot afford to lose them. Honey is obviously an ongoing debate within the veg community. This controversy as it pertains to vegetarians is a fraction of a much larger issue. The veg community is well aware of the destructive effects that factory farming reaps on our planet; that which is equaled by the destruction it has on our health. However, the key role that bees play in production of food is vital to the food we eat. One so vital in fact, that if bees were to die off, refilling the giant void would be next to impossible and we would be in major trouble. So we have the issue of honey, as part of diet, (to be, or not to be.) This is rather small in the overall scheme of things. Then we have bees, an essential part of us having food to eat. While it may be that not all people eat honey, all people must eat food. I think you will agree with me, that it is time to put things into perspective here. Perhaps honey can be seen as a small token of appreciation shown to nature. Perhaps something to be more mindful of than ever before, treated as nature’s gold, but with a newly adjusted ratio of acceptance to resistance. Honey is a sweetener, and as with all sweeteners should not make up the bulk of a person’s diet. Sweeteners are intended as treats. While vegans may prefer sweeteners such as brown rice syrup, Agave, Stevia, and other sweeteners, let’s remember that honey, used as a sweetener, (which should equate to sparingly) does offer some benefits. I submit that the two words to be concerned with here, are balance and mindfulness.The word balance applies to nearly everything, (no wonder it is one of my favorite words to use!) Obviously, with honey being a sweetener, the word balance applies well. Maybe a jar a day, is a bit much. A sweetener, an occasional treat, as part of balance, why not? Viewed as such, and not as a major source of income for those who produce it. An occasional treat of honey offers nutritional benefits and quite likely benefits the environment in an unexpected, indirect way; that of helping all of us who are arguing about small details to come together in yet another way. One more dark crack sealed, another bridge built. I submit that it is this, ways of coming together, focusing on where we agree, and on basic needs and common wants, which most effectively fills in the dark voids of tension and disagreements of these often slivers in the woodpile details. I believe that mindful, conservative consumption for those people who do choose to eat honey, whether veg or not is going to prove far more beneficial to all involved over time, including the bees, people and the earth. We can choose to offer suppport to local bee keepers, who are practicing ecologically sound methods of beekeeping, who show genuine concern for, and mindfulness of the planet. What key role (bee caregivers,) is more deserving of our conscious support than this? There are plenty of sweeteners to choose from: There are plenty to go around, and as conscious consumers, the power of choice, as we continually strive to prioritize and balance our needs works wonders in our world! It really does. Over the course of weeks that this article was formulating, lo and behold, I was glad to find myself in communication with a local beekeeper. I was glad to be informed that there are environmentally responsible, respectful, sustainable ways of harvesting honey, and reducing bee harm as much as possible in the trade, (often referred to as the craft.) What’s more, is that ecologically responsible methods are slowly but surely becoming the standard in the trade. I really did want to jump for joy! I was so happy to hear this. Throughout our correspondence, this knowledgable “beek” listed several environmentally responsible methods. These not only included reducing the harm done to the bees directly as much as possible while harvesting honey, but also not taking honey from the bees seasonal stores, or the honeycombs. The responsible beekeeper makes sure that any bees bought or sold are healthy, strong, free of parasites and disease. They ensure that bees have plenty to eat, and possess a basic understanding of bee health. Many beekeepers strive to feed their bees natural food, to keep them strong and fit, helping to ensure that bees continue to remain strong, and do what bees are intended to do. This has been loosely compared to keeping pets responsibly. My background in exotic reptile pets (see page above) has taught me that in some ways, understanding these creatures, essential to the balance of life on the planet, and providing responsible care, may soon be a last chance for them. Habitat loss is apparent. Just as with reptiles in the wild, maybe the time is not far distant, that the bees remaining in the wild, will not suffice. Maybe it is a time to responsibly, and oh so carefully intervene on behalf of the bees in this way. I think that this is the exact approach that beekeepers must uphold as a standard, and the only standard that conscious consumers should be willing to support. Don’t use pesticides, herbicides or other toxic lawn and garden chemicals. These weaken and and/or kill bees. Research methods of natural pest control. There are many inexpensive, safe home remedies using simple ingredients such as epsom salts, vinegar, hydrogen peroxide, black pepper, and garlic. They are effective for weed control and pest repellent. Bees will often use hollowed stumps or similar structures for their hives. Get creative! is there part of a tree, or natural crevice in your yard or field that you can use to attract bees? Remember that keeping and attracting bees is good. Bees are not the same as wasps or hornets. Bees are beneficial (and essential) insects. Support local beekeepers that practice environmentally sound/bee sound practices. There really are so many ways of meeting each other half way where there is a large-scale disagreement. There is a fifty-fifty in respecting differences, values, but understanding the sense of urgency for a sustainable world. (May all always have enough.) I encourage each and all to consider their actions and choices and doing what each can as they can, in coming together for the overall good, avoiding rigidity, and adopting a willingness to hold to values; but also being willing to adapt and flow toward a sustainable, progressive world. Please join me in considering that it is time to save the buzz for the big environmental and health issues, such as factory farming, and to please remember the bees in all that you do. That should be a given, right? Not only for bees of course, but for all creatures. Practice conscious consumption, whether a strict vegan, vegetarian, or just a person who wants to eat food, please, please remember the bees. At Wellnessdiaries.com September is “Remember the Bees” month. Please join me and pass it on.